This is the first in a two part series reviewing the Pathfinders Medieval Catapult Wooden Kit. In this first part, I will tell you about the kit and give you some assembly tips. In part two, I'll tell you how I went about making the catapult look like it truly belongs on an ancient battlefield. The kit comes with nearly everything you need to assemble the catapult. The only material you need to provide is white Elmer's-type glue. The kit comes with a small swatch of sandpaper and suggests that you have a ruler and scissors available. The kit arrived in a slender cardboard box with instructions and parts separated into two plastic bags. No excessive packaging, no impossible-to-open-plastic-clamshell. I like that. The kit contains just over a dozen wooden parts, two washers, some string, a small bit of wire, and some soft Play-Doh type clay -- otherwise known as "ammunition". The wood is a clear-grained pine. Just one of the pieces of my kit had a medium sized knot in it. It had been filled with a little plastic-wood type filler to keep things solid and smooth. The instructions are printed in black and white on 8 pages. There are instructions in English, French, and German which is nice, though they are intermingled in a way that requires a bit of scanning and rescanning. I found the directions to be very good, though there were a few vague spots. I'll address these very minor pitfalls in the next section. The line drawings in the instructions are simple and clear and serve as the primary means of instruction. What helpful hints do you have? Overall, the kit itself took me a little over half an hour to make, though they suggest that you set aside 1 to 2 hours. The kit is suggested for ages 9 and up. That sounds about right to me. Read the entire instruction manual all the way through, paying attention to the drawings. This won't take long and this will prevent any possible confusion. At first, I wasn't sure how to tell the crosspiece that the holds the trigger from the upright braces. It's quite simple really: just read the directions (I hadn't yet). Note that they have thoughtfully placed red marks on the crosspiece and the base with which it mates. The kit is held together with pegs that are glued in place. There are 18 total. Be sure to sift through the lot to find the two that a just a bit longer than the others. These are used to add tension to the string. I found that the pegs fit rather tightly. The glue helps to lubricate them a bit. I gently used a nonmarring hammer to tap the pieces together. Alternatively, you could use the included sandpaper to slightly taper the ends of the dowels and ease their entry. A small hobby or razor Saw is handy if you want to trim some of the dowels that are left a bit over the surface of a few parts. Consider staining and/or sealing your model to increase its beauty and lifetime. More on this in part 2 of this series. 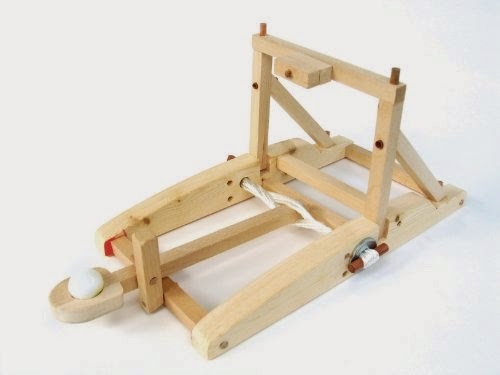 The packaging claims that the catapult can throw a soft clay ball over 15 feet. This is absolutely true. I easily achieved distances over 20 feet and don't think I have put undue strain on the model. Should you choose to add extra horsepower to your model (and this is just my speculation), I believe some added string and a reinforced crossbar would allow you to throw a grape twice as far as advertised. Everything that was promised was delivered and the model outperformed the advertising copy. When was the last time you purchased a product that did that? I give the Pathfinders Medieval Catapult Wooden Kit high marks. In the next installment of this article, I'll show you how to the catapult model look ancient and ready for a siege.